NOW-NYC is sponsoring this workshop by Hollaback, which will provide training in what to do -- and what not to do -- if you witness an act of harassment. The event is free. RSVP here. This is the first National Indivisible Day of Action. Indivisible chapters throughout the country are unifying for massive protests in front of Senators' state and D.C. offices in order to kill off TrumpCare once and for all. Indivisible UES will be joining numerous other local Indivisible groups in front of the building where Senators Chuck Schumer and Kirsten Gillibrand have their offices. It is important to show high turnout across the nation in order to drive home the point that this country does not want the GOP plan. Bring friends, neighbors, and family members. 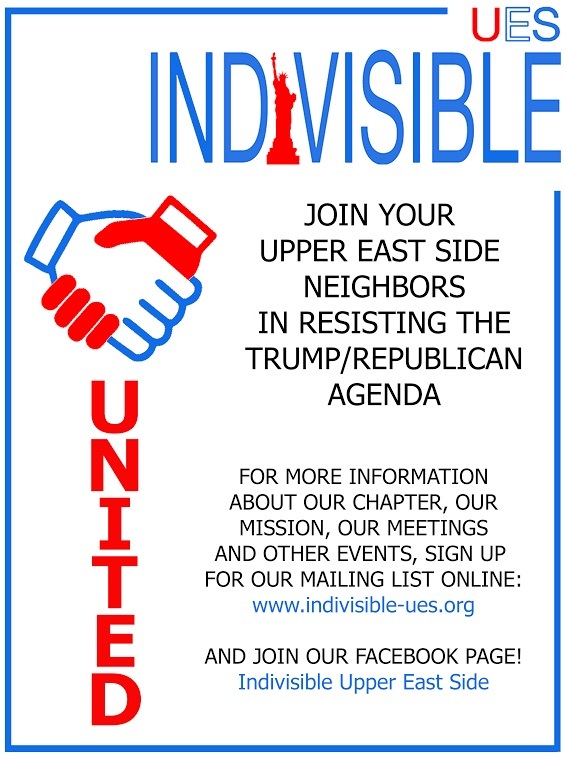 Print this Indivisible UES sign and carry it at the protest in order to help our members find each other. You are also encouraged to print pictures of loved ones and tell their healthcare/insurance stories. For an example, see executive committee member Victoria Barry's Facebook post. If you cannot join the protest, call the offices of Schumer (212-486-4430) and Gillibrand (212-688-6262) during the day. Here is a suggested script. Fact sheet about the IDC. New York State Senator Michael Gianaris will speak at this event, which is co-sponsored by NY Indivisible, Sustainable Staten Island and Staten Island 4 Change. Travel time by car is approximately 40 minutes. For directions and other transit suggestions, click here. This spring, New York Governor Andrew Cuomo joined with California Governor Edmund G. Brown and Washington Governor Jay Inslee to announce the United States Climate Alliance, a coalition that will convene states committed to taking aggressive action on climate change. (Other states have since joined.) Next week, we will have a letter and phone script related to Indivisible UES's environmental concerns. Until then, you can pledge your support for the Climate Alliance by signing the petition here. If you participated in Tuesday's #KillTheBill healthcare protest, take the day off. 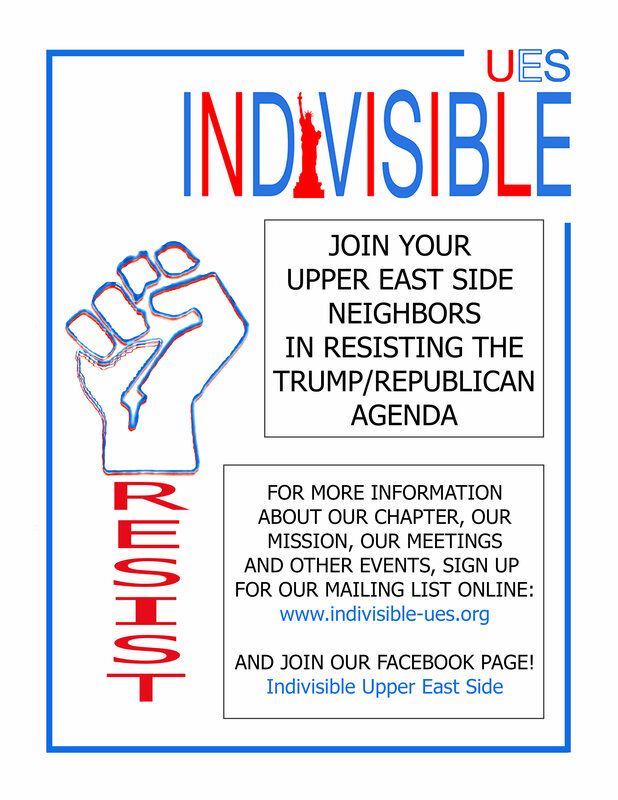 If you didn't get involved, print out the fliers advertising Indivisible UES and distribute at least 10 to your neighbors/colleagues. NY Indivisible is organizing a pot-luck picnic in Central Park. If it's a nice day, why not enjoy some time outside?